Having missed the festivities around here during holiday. For what I've known, you guys are not from India, so feel free to munch on your airport carpet while you can. You are welcome!! Alex goes to India on business now and then. Thanks for the warning, I'll let him know. Wonder what their carpets are made of? 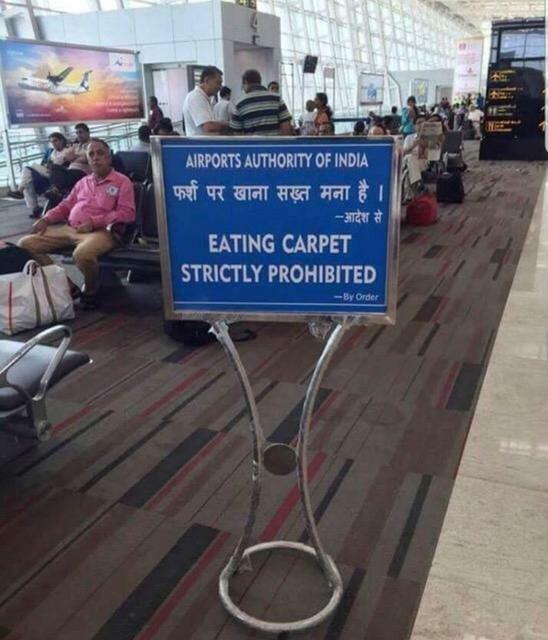 Added: According to numerous websites (including this one), the Hindi script actually should have been translated as "Eating on the floor is strictly prohibited," presumably to help keep it clean. And here I am thinking that the carpet must be irresistible. I thought India is first..second biggest English speaking country? But maybe that is not their first language. Anyway I'm disappointed that there is no delicious carpet anywhere in the world. Candy Carpet in Chengdu, China. I thought India is first..second biggest English speaking country? But maybe that is not their first language. There are 22 major languages in India, written in 13 different scripts, with over 720 dialects. The official Indian languages are Hindi (with approximately 420 million speakers) and English, which is also widely spoken. Note that less than a third of the population speaks Hindi, with the rest speaking a large assortment of other languages and dialects. Even though the country was glad to see the end of British rule in 1948, they nevertheless saw the value of keeping the English language. Unlike HIndi, it's not the mother tongue of any ethnic group within India, and (also unlike Hindi) it's widely spoken outside the country as well. It's my impression (from Indians I've known in the US) that hardly anyone in India has English as a first language, but most well-educated Indians speak English as a second or third language. Of course what they speak is Indian English, but that's largely a matter of a unique accent, which shouldn't affect how they write signs. I'm going to guess that the English portion of that sign was worded by the sort of person who thinks they understand the language better than they actually do, plus was trying to keep the wording as brief as possible (which is hard enough to do when you're actually fluent). Goodness knows we have plenty of those people right here in the US, and they're native speakers! 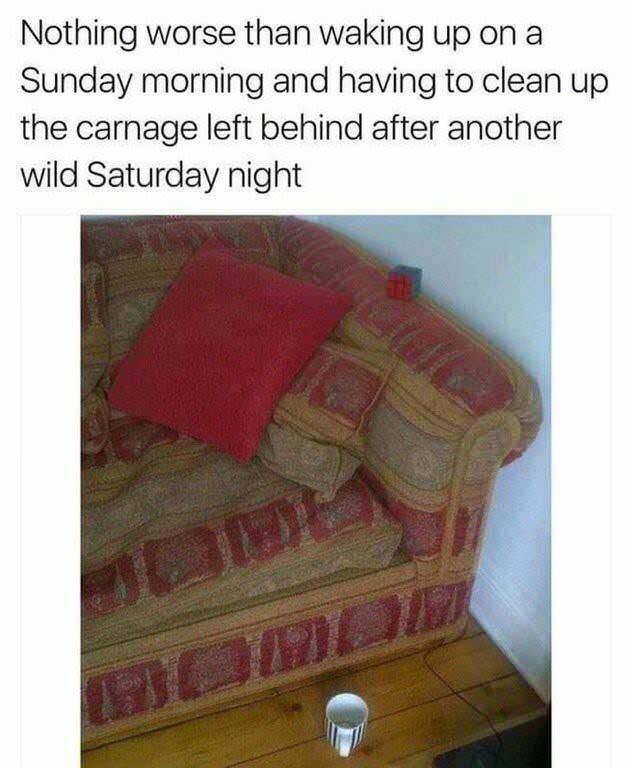 This speaks to me (although in our household, there'd be more dog hair on the couch). *grabs some water and joins you* 'sup? Sorry, Tobe -- didn't see this till just now. Do you know what happened (but there's no way to retrieve the ring), or did it just disappear? Dunno if this will help you feel any better, but I've lost mine twice, and it turned up again both times. My ring had been a bit too big, so it would slide off my finger too easily. The first time, I had no idea what had become of it (until I found it, months later, in a boot that I rarely wore), but the second time, I felt it slip off my finger and knew it had flown into a patch of thick vegetation. We rented a metal detector and Alex found it. After that, I had it resized! Glad you found it Tobe (Tobe?? Carol started it) We are wearing a pair of 50 bucks silver ring and keep the real one at home...err...somewhere. And since I am not as lean as used to be, it would take a Sherlock to pry it out of my hand and commented that my life must be boring unlike Jennifer Wilson and since it's probably a size smaller now and the tan line seems to be immortal. Anyway, sorry for not being around for quite sometime. It seems quite difficult for me to tie myself to chair for a couple of hours now that I don't have to. But rest assured, I haven't cheated on you guys, basically I don't have other online social presence but here. I really wonder how others manage to stay online with sosmed and all, I think I'm better at maintaining relationship back then through hand-written letters and emails. Seems I don't miss much guys, where have you all been? It's so quiet around here. Do you guys think this would be a good gift for Sherl? 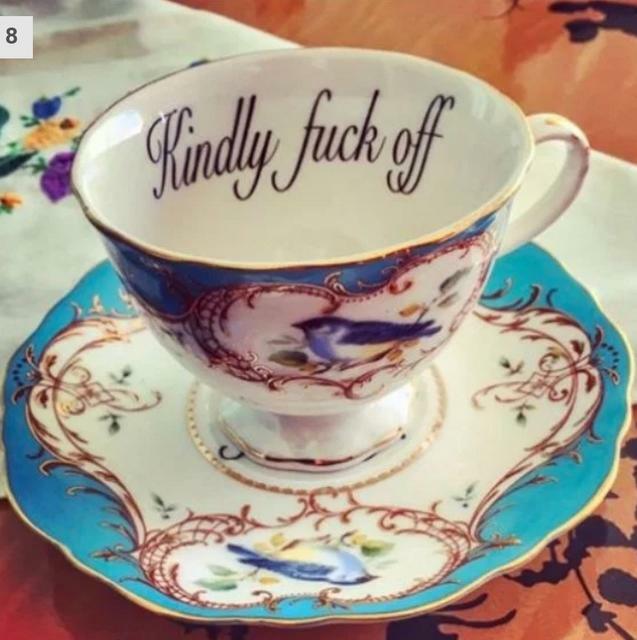 Or is it too polite? VBS! I haven't been around much either, lately, and now you pop up too. Some stars must have aligned. Are you still unemployed, is that why you're not tied to a chair? Tsk. Yay, VBS is back too! I second Arcadia's question: How did your final days on the old job go? Have you decided what sort of new job you'd like and in what geographical area? Basically, how's it going? And yesterday my laptop tried to electrocute me at least ten times for the stretch of the time I spent here, not mild ones, but the kind that makes you jump. Excellent idea. How could I forget about Mycroft. This seems like good present to my nosy relatives too. Another thing that was uncomfortable, I actually felt guilty and touched because those colleagues of mine, got me carefully chosen stuffs, which I never expected them to do, especially from one I have only known for couple of months, and I know he doesn't make much. And they seem pretty down and actually trying to talk me out of leaving, which wore me down after quite a lot of attempts. (To be fair, it seems common that people actually do change their mind or it's not uncommon that resignation is being used as empty threat, actually I should know, but it's still surprising to me to see their confidence at the beginning, especially my boss that I probably just need more perks to stay) after which they still contacted me for work matter for awhile which unfortunately I have to distance myself with so it wouldn't disrupt with the process of bosses getting my replacement or them having to take responsible for decisions I have no right to make. Another thing that surprised me, this was the longest I spent time in a company. But maybe, I'm getting very good knowing you shouldn't get attached to work that I had started detaching myself when things started to go south, which was quite a long time ago. The detachment was disrupted for a while, for this group of colleague, but I managed to stand my ground, or so I thought. Anyway, I had zero, zero feeling of sadness or sentimental for leaving the company which really surprised myself, well, until they screwed it up by unexpectedly showing they care and actually I think I do too, for my team, my colleagues. The company can kiss my dog. To be honest, I have been going around places so I manage to avoid socialising with them since I have valid excuses, but I'll be back to town next week aaaandd I'm running out of excuses. I'm doing fine, for now, thanks. Although I have this naggy feeling that I have to make something happens soon, but I know it'd take time. It's long is it???? Pretty sure you regret asking! Been watching the TV coverage from Crufts dog show and there is lovely hound on, he's called Sherlock Holmes! Go Sherlock, hope you win! The company can kiss my dog. But that would be a privilege! I'm so curious! It burns! Tell me what you did, tell meeeeee! If you're in the US (but not in the sensible states of Hawaii and Arizona), don't forget to observe the quaint ritual of setting your clocks forward an hour. You are right, I shouldn't subject my dog to that kind of inconvenience. But if it helps anyone should be worried about their face's well-being for attempting. Not sure I should I don't want you to be disappointed with my answer. Let's say it involves 'some' conservation and 'some' research. Anyway, when I first switching to this industry, I thought it'd be my dream job. But as with everything (same thing applies with knowing a human) the more exposed you are to something, the more you know about the whole package, good and bad. And there could be things that don't gel with you or your principle. In my case, it strikes my conscience and ethic, my idealism. My colleague who is more hands-on put it as 'selling our soul". For me I could say luckily I'm not at that level or practically I could say I tried in my position to counter those negativity, well, for a little bit. That was what I tried to do, using little bit of power I have to make things better, however, realistically, it doesn't work as much as I wanted to. I was only another cog in the wheel, they would run better with me but without me they are fine. I could only make that much noise. I'm the fly trying to get them to eat that medicine by buzzing on their head so that it helps their actual headache that they try to deny. (I never say I'm good in example!!) In fact I got into a lot of hot water trying to. With little success I have, there were much more push back. I realize as well that the burden I have in my head for being connected to what I do is gone when I left. It still makes me feel bad, but at least, I'm not there as part of those if you get what I mean. In fact, there was a very bad example of this poor ethical situation on my last week and it really goes against what I want to be, I was left scrapping around trying to make the situation better but at the end there was nothing I could do. The worst it, if I really really put my myself in the shoes of the company, I could see their reasonings. It's valid, it's just not the best. The best means costing the company a lot of money, so they do what everyone do; make it look good in the surface. So, I guess I'd say this turns something I like into something I don't. Something I thought it's good but then you realize the good might outweigh the bad and something that still seems good to almost everyone else. Gotta go, hope that explains??? I don't have time to check what I wrote, hopefully I explain what I have in mind correctly. I just found out that the Sherlock Forum has a Tumblr by absent-mindedly typing the address wrong, lol.